The Record Company is back, the trio is still keeping it real, and they have much on their minds. It’s been two years since the band's blazing debut, Give It Back To You, and the group's incendiary brand of roots rock proved that the classic, tried-and-true configuration of guitar, bass and drums worked just fine. Now, the trio returns with their sophomore release, All Of This Life, a confident set that expands on the band’s blend of roots rock, blues, and soul and the enhanced scope of their songwriting. Drummer and keyboardist Marc Cazorla, bassist Alex Stiff, and lead singer and guitarist Chris Vos came together in Los Angeles around seven years ago. During the early years, they honed their craft playing live via the circuit of small clubs and bars. They recorded Give It Back To You by themselves, at home. 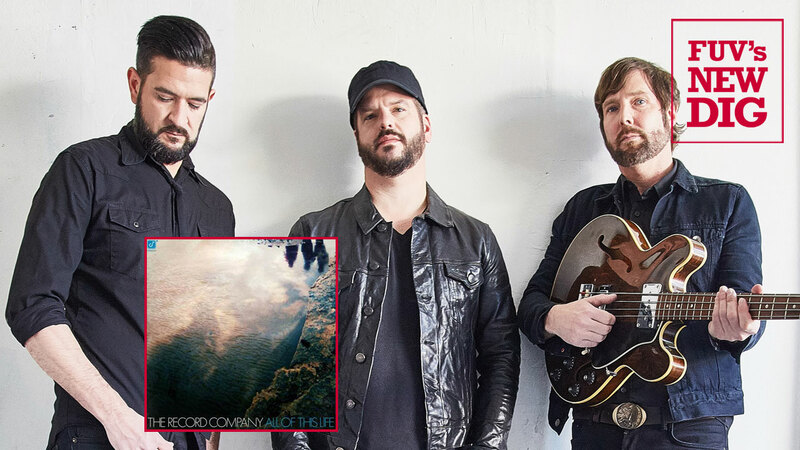 Nominated for a Grammy award for Best Contemporary Blues Album, the Record Company became an instant FUV favorite after their riveting live show at Rockwood Music Hall in the spring of 2016. With All Of This Life, the Record Company's three members, who introduced some of their new songs in a brand new FUV Live session earlier this year, don't tinker with the formula that got the group to where it is now. Instead, Carzorla, Vos, and Stiff simply set up and play. They hit the ground running with “Life To Fix,” an exuberant single energized by a rambling bass riff and stomping beat. The song sets the attitude for the rest of the record with lyrics dealing with picking up the pieces and getting back on track. The rollicking harmonica-driven workout “I’m Getting Better (And I’m Feeling It Right Now)” picks right up from where the first track left off, celebrating rebirth and revival in a raucous fashion. Despite a tempo change, that theme is just as prominent on the bluesy “Goodbye To The Hard Life.” Elsewhere, the band slips into a reflective mood on the acoustic rocker “The Movie Song." The sinister "Roll Bones" addresses the gambles one takes in life. Cazorla, Stiff and Vos wrote all the songs on All Of This Life and recorded the bulk of the album not at home, but in a proper recording studio. The trio also produced the album themselves, with Stiff doing much of the heavy lifting, which included some engineering. Combining the basic elements of American roots music, the Record Company plays it straight and simple. Their unembellished approach is like musical comfort food and with All Of This Life, they show continued maturity through sharply-observant lyrics. Vos, Carzola and Stiff take the visceral excitement of their live shows and incorporate onto this brash and bold second album, the perfect antidote to any summer blues.